By the time you read this, I might have already left for my 11-day trip to Ecuador, where I’m attending a College of Curiosity Field trip, going for a few days to the Galapagos Islands, and then for a three-day trek to a birding lodge in central Ecuador, which is accessible by a canoe ride up a tributary of the Amazon River! This is the first time for a vacation of this type. I camped a fair bit when I was younger, but it was generally in the Rocky Mountains and never very far from a paved road. This is not an eco-tour, but it’s still a bit rough compared to city vacations. I’ll be posting some pictures on my trip, whenever we are near a signal, but most of them will be to my Facebook and Twitter accounts (@goddessgeek). I’ll write about my adventures in the coming weeks. at the knee, three quick-dry long-sleeved shirts that are ventilated and have roll-up sleeves, a couple t-shirts, and some Tevas sandals and a pair of Keene shoes. I’ve invested in three pairs of quick-dry undies (the ad :17 countries, 6 weeks, one pair of underwear. Okay, maybe two). I have a nice shirt and dark pants for the plane in both directions, and a very light raincoat/jacket for Quito, which is at 9350 feet and can get cool in the evenings. Some biodegradable soap to do laundry in the sink. That’s it. 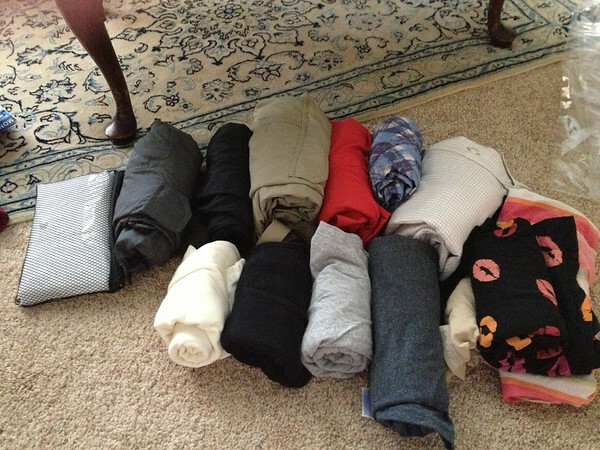 I rolled everything up, and then divided the clothes into two piles and put them into Space Bags. 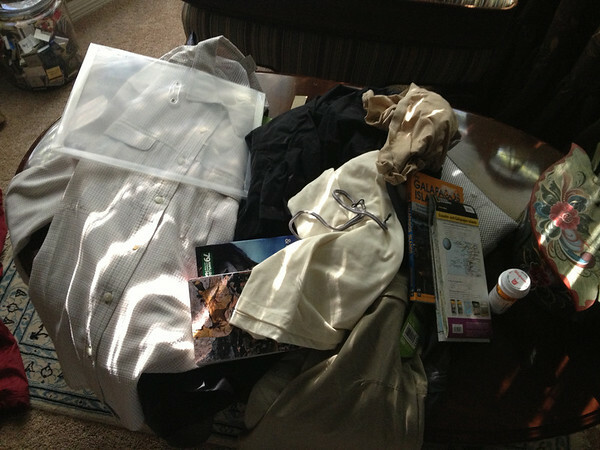 Since we will be packing/unpacking at various hotels, the small cruise ship, and the birding lodge, I divided the clothes into days rather than by type so that I only have to open one pack to get clothes for a day. Underwear is stuffed into the shoes. 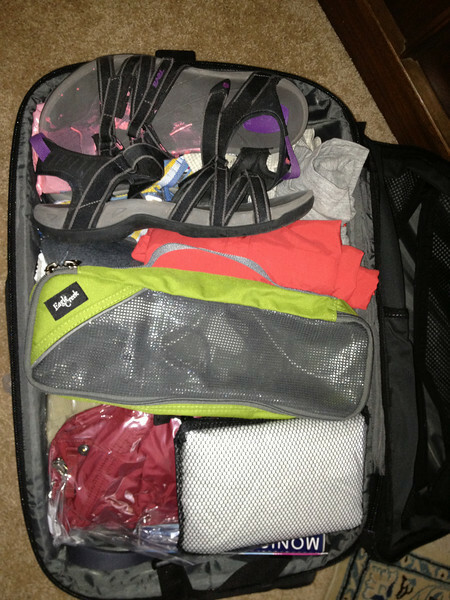 Since I do not want to check luggage, I make sure everything liquid will fit into one ziplock. I need to carry mosquito repellant for the Amazon, and lots of sunscreen, which take up part of the room. I tried to find some powdered toothpaste – no luck, but my moisturizer is tinted and 30 SPF, so it can do double duty. Power cords and my wifi connection. 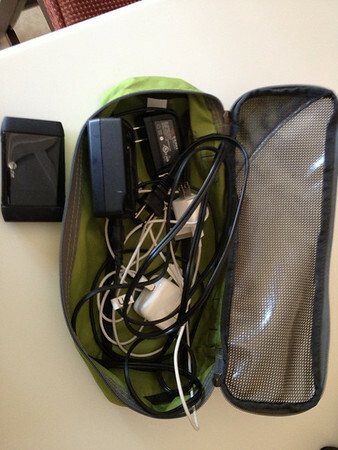 I am NOT carrying my MacBook, my Kindle, my GPS. This is traveling light! I have another ziplock with my ‘first aid’ kit. 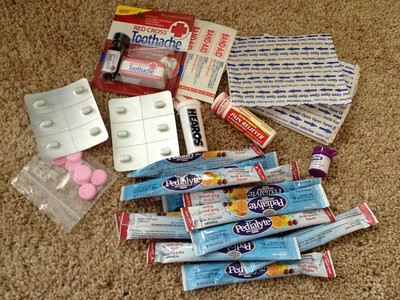 I’m not going into some remote land and sleeping on the ground under a tarp, but I wanted to make sure I have some band-aids (plasters to some of you) and other supplies. I am taking several Pedialyte Powder pack tubes. You can pour one of these into bottled water for dehydration. A couple years ago, I had a plant start-up near Mentone, Texas, where the temperature hit 110- 120 F every day, and drinking a couple of these during the day stopped the severe night time cramps and heat exhaustion we suffered. Much better than Gatorade! My backpack will contain a small messenger bag purse, my iPad, some knitting for the plane, my cameras, and binoculars, small snacks, and my glasses and sunglasses (I have both regular to wear over my contacts, and prescription sunglasses). 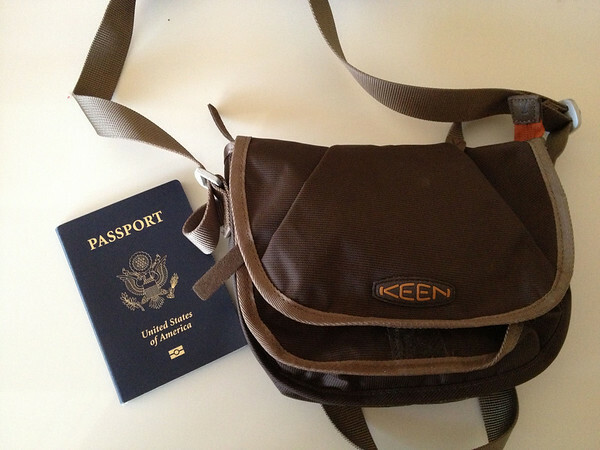 I also carry a plastic envelope that contains my itinerary, flight information, hotel confirmations, and any other information I need on a trip. 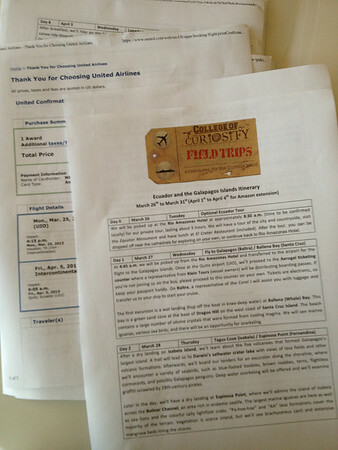 I discard the pages as I use them, and at the end of the trip usually dispense of the envelope, as well. Less things to carry. ‹ Friday Fun Flicks – Chick O’ Stick! Heh…I knew what you meant, but I thought this was a funny sentence: “I tried to find some powdered toothpaste – no luck, but my moisturizer is tinted and 30 SPF, so it can do double duty.” See you soon! Ugh. Not very good proof reading, eh? Great post Naomi, and thanks for linking to one of my posts. I saw a fantastic post recently about power cords. Folding them up and storing them inside loo paper rolls. I think they’d pack down even smaller then. Have a fantastic trip and look forward to reading about it. Sounds like you have it down to a science. Can’t wait to read all about it and see the pictures. Looks like we are about ready for our big trip.